Emulsification is one of the mysteries of food technology & certainly in my degree course, was not covered in sufficient detail. 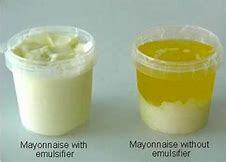 Emulsions are very important in systems containing fats & water such as caramel, ice cream, frostings, spreads & mayonnaisse. Making a successful emulsion can make an enormous difference between a smooth eating product, that has a long shelf life, & one with poor organoleptic properties that shows signs of separation & loss of functionality. It involves the preparation of two materials, oil & water, which do not mix under normal conditions into a stable formulation. To create such a product there are two important elements. The first is a suitable link molecule which is described as an emulsifier. These are composed of a part that is lipophilic which is attracted to the oil phase & another hydrophilic ie attracted to water. These unusual molecules can part dissolve in oil & water. There are many different types & selection of the correct one requires skill & experimentation to establish the correct dosage. Under appropriate conditions this can produce a stable emulsion. The second & often neglected part of emulsification is high shear or vigorous mixing. This reduces the fat globule size. The smaller the globule, the more stable the emulsion. The process often requires heat, depending upon the fat & emulsifier type, & in the presence of a suitable emulsifier, gives the required result. Mechanical emulsification ranges from a simple mixer to a Silverson-style high shear head or a two stage high pressure homogeniser. Emulsifiers can also play a major role in controlling staling & even sugar crystallisation. Sweet Innovation has considerable experience & a network of specialist contacts who can help in product design & addressing problems with current products.